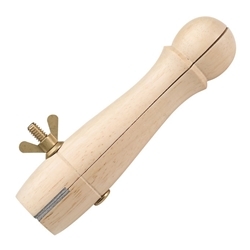 Spring-loaded wooden ring clamp with brass screw and wing nut for more precise control. Leather-lined jaws prevent marring. Rounded clamp end allows easy pivoting and rotating. Measures 5-1/4" long.